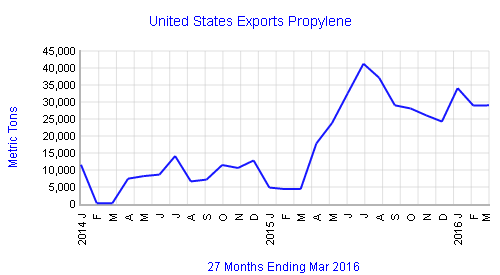 Much higher propylene monomer exports from both North America and Western Europe to Latin America were among the trends visible in global propylene trade through March, 2016. In 2015, Latin America imported 280,000 tons of propylene monomer, up nearly 200% from 2014. North America supplied about 80% of the total, with the remainder sourced roughly equally from Asia-Pacific and Western Europe. Mexico and Colombia were the leading growth markets. Leading suppliers: US, Spain, Italy, Netherlands, Taiwan and Japan. Much higher propylene imports into Latin America were also evident through first quarter 2016, North America and Western Europe top suppliers. This entry was posted in Trade Trends and tagged Asia-Pacific, Colombia, Ethylene World Trade Report, Italy, Japan, Latin America, Mexico, Netherlands, North America, propylene, Propylene World Trade Report, Spain, Taiwan, US, Western Europe on May 20, 2016 by JJSUDOL.